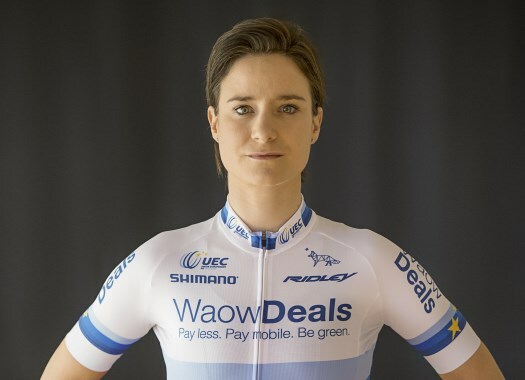 Marianne Vos (WaowDeals) has taken the second victory in a row at the Ladies Tour of Norway. The rider was the fastest at the final sprint and kept the GC lead for another day. The second stage of the Norwegian race was 127.7 kilometres long and took the riders from Fredrikstad to Sarpsborg over a hilly route. The stage was rainy and windy and made the racing more difficult for the riders. The peloton raced at a very high pace and that caused breaks in several sectors but the strong riders of each team worked hard to keep the bunch together. With 17 kilometres to go, a group of six riders that included Marianne Vos, Lucinda Brand, Coryn Rivera, Elisa Longo Borghini, Kasia Niewiadoma and Gracie Elvin, took the lead and created a gap but the speed set in the pack by Boels-Dolmans caused that they were caught them a few kilometres later. There were several attacks in the final kilometres by riders like Brand and Niewiadoma but the reduced group caught them at the final metres. The rider of Canyon-SRAM launched first the sprint and Vos stayed at her wheel, overtaking her at the last minute and claiming the victory. Emilia Fahlin (Wiggle High 5) was also stronger than Niewiadoma, who crossed the finish line in the third position. Vos keeps the leader's jersey with one stage to go.